My hair tends to be very oily at the scalp. I know hair experts strongly recommend that you don’t wash your hair every day. I still feel I need to suds my hair up everyday in order for it to feel clean. I also like the way it looks when I can style it fresh after day after a fabulous full lathering shower. I am looking for recommendations on how to still get the same feeling as a daily shower without actually washing it, but not getting oily roots. I also want to know if I can still wash every day without damaging my hair. I also want my hair, which tends to get dry at the ends, to feel soft and moisturized without a heavy residue. Can you please recommend some options I can consider that will allow me to get the clean feeling. 1. Implement a dry shampoo cleansing schedule, moving it into your wet cleansing rotation. Wet-wash with water & shampoo 3-4x a week and dry shampoo the rest of the week. A great dry shampoo applied at the roots will soak up any oil at the scalp while allowing the rest of your hair to retain some softness. This plan also has the advantage of eliminating a few wet washes and the related wear & tear of using water, shampoo & hot tools. 2. Combine dry shampoo with wet washing. Apply dry shampoo to your hair at the roots before you wet wash it. That way you can use only greatly reduced amount of shampoo formula when you wet wash.
3. If you still feel you need to wet wash your hair every day, consider diluting the shampoo you use. 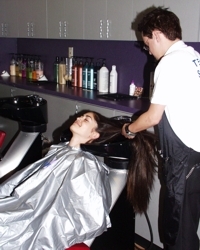 Experiment with mixing 1/4, 1/2 or 1 teaspoon of shampoo in 1 clean gallon jug of lukewarm water. Shake to form a suds. Get hair super wet. Drizzle diluted shampoo over the top of your roots since they need the most cleansing power. 4. Allow the suds from your roots to gently flow down the length of your hair from the roots to the ends. Be careful not to rub or scrub. Pat shampoo into strands. 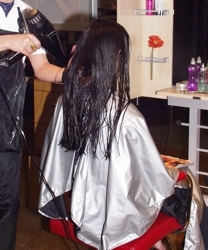 This minimizes the potential for full strength shampoo to be too drying for your hair. 5. To make sure your hair is moisturized and soft w/out a heavy residue, you can use a rinse-out conditioner during your wet wash cycle, leaving a tiny bit on your strands during the final rinse before the cool/cold final rinse. Additionally, you can apply a great leave-in conditioning spray after you finish your wet washing. 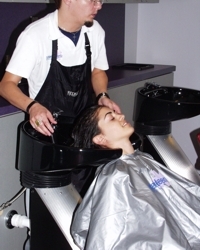 Make sure not to apply any oil generating conditioners or styling products to your roots, to minimize oil build-up. 6. 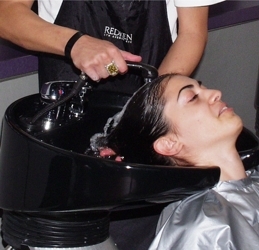 Customize your hair washing experience. Experiment with a variety of wet/dry washing techniques which allow you to address your oily roots while minimizing the drying impact on the rest of your strands.